HBO's Game of Thrones was only nominated for one Golden Globe award during last weekend's telecast, although it was the biggest TV award, for Best Drama Series, which it ultimately lost to Hulu's The Handmaid's Tale. While some of the show's stars were in attendance, like Emilia Clarke (Daenerys Targaryen) and Kit Harington (Jon Snow), others were not, such as Maisie Williams, with the actress taking to Instagram to explain her absence. As it turns out, the 20-year-old actress instead used the opportunity to dress up as her "idol," Coraline Jones from the 2009 stop-motion animated film Coraline. Here's what the actress had to say to her Instagram followers about her absence at the Golden Globes. "I could not attend the golden globes this year. Instead, I took this weekend as an opportunity to fulfil all my hopes and dreams by dressing up as my idol, Coraline. Don't @ me #coralineandwybie #DONTEVENTHINKABOUTGOINGOUTSIDECORALINEJONES"
The actress shared a photo of herself, along with an unidentified friend who was dressed up as Wybie Lovat from Coraline. Game of Thrones has been nominated for Best Drama Series at the Golden Globes for five of its seven seasons thus far, but it only has two acting nominations, one in 2012, where Peter Dinklage won for his performance as Tyrion Lannister, and last year when Lena Headey was nominated for Best Supporting Actress. Conversely, the show has amassed 110 Primetime Emmy Award nominations and 38 wins, including six consecutive Outstanding Drama Series nominations, a streak that ended this year when the show debuted too late and was ineligible for the awards ceremony. 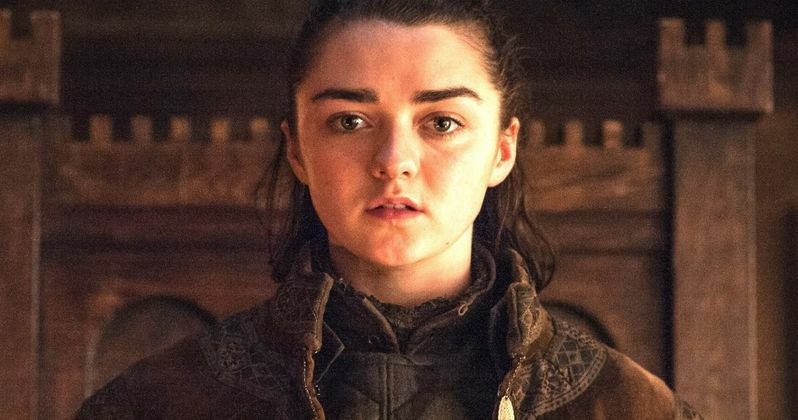 Maisie Williams' Arya Stark is one of just a handful of characters who managed to survive from Season 1 all the way up to the final season, which is currently in production. Whether or not she manages to survive the final six episodes is another story entirely, especially since the show is so far ahead of the George R.R. Martin books at this point, with fans still impatiently awaiting the author's last two books in his A Song of Ice and Fire novel series. There has been no confirmation as to when these books might be ready, although George R.R. Martin has hinted that the sixth book, The Winds of Winter, may be ready for publication sometime in 2018. It also seems likely that the final book, A Dream of Spring, will not be ready when Game of Thrones Season 8 debuts in 2019. While the show has been a massive success on all fronts, it has also become one of the most pirated shows of all time, with the show being named the most pirated show of 2017, the show's sixth year in a row receiving the "honor." The show's piracy was in the news more than usual as well, with a cyber attack on HBO that resulted in the leak of Game of Thrones scripts, along with episodes of other HBO shows like Ballers and Room 104, while a full episode also found its way online through a separate leak. With an entire year ahead of us without any new Game of Thrones episodes to watch, it will be interesting to see if the show will still top the piracy list without a new season hitting the airwaves. For fans in Los Angeles, there will be Game of Thrones fan screenings on Friday, January 19 and Saturday, January 20 at Regal LA LIVE Stadium 14 (1000 W Olympic Blvd Los Angeles, CA 90015). The Friday screenings will be from 5-7 PM PT and 8-10 PM PT, while the Saturday screenings will be from 2-4 PM PT and from 6-8 PM PT. Fans will get to see Daenerys' dragons in full force as she rains down fire and blood on the Lannister army in the jaw-dropping episode, "Spoils of War," on the big screen, along with the Blu-ray and DVD exclusive bonus feature, Conquest and Rebellion, a 45-minute animated story of the turbulent events that shaped Westeros. While we wait for more on Game of Thrones Season 8, take a look at this photo from Maisie Williams' Instagram that shows why she didn't attend the Golden Globes.